Please also visit our archived tributes, these pages will be remodeled in the near future! This memorial site is dedicated to those FeLV kitties that came into our lives and stole our hearts!. We understand the grief of losing a cherished and much loved pet or person. We felt that this site would help loved ones express their feelings about their dearly departed loved ones and at the same time possibly help them gain closure. And in doing so it will also help us raise the money we need to save kitties that more often than not have their lives ended when they test positive for FeLV. 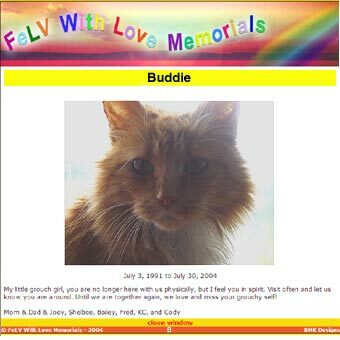 It is our hope that our "FeLV With Love Memorials" website accomplishes this. To write a beautiful memorial for a much loved and missed pet or person, please click here.